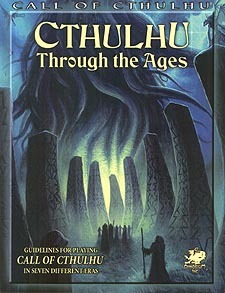 Cthulhu Through The Ages was created to help players adopt the latest rule-set for the wide range of settings published by Chaosium. Here you will find straightforward guidance and era-specific rules for investigator creation for seven different settings along with updated rules for combat for Cthulhu Dark Ages, Cthulhu Invictus, and Mythic Iceland, as well as a sprinkling of other topics like scenario seeds, setting-specific monsters, and investigator organizations. Some settings like Cthulhu by Gaslight and the Dreamlands will be familiar to many veteran players of the game. Others, like Mythic Iceland, Icarus, and The Reaping, will be new. Settings like Icarus and The Reaping are offered as possible visions of the future. The material herein is designed to inspire, placing the Keeper in the driver's seat to fine-tune the materials in order to construct the setting. Also included are newly-designed Investigator sheets for each of the settings detailed: Cthulhu Invictus, Cthulhu Dark Ages, Mythic Iceland, The Dreamlands, Cthulhu by Gaslight, Cthulhu Icarus, Cthulhu End Times: The Reaping.